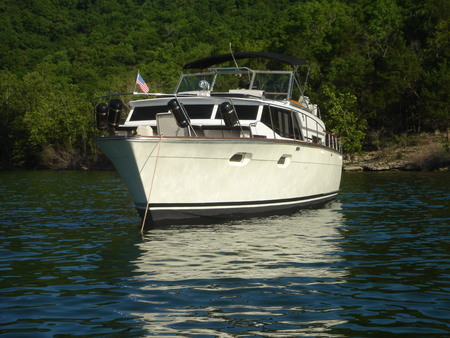 The 36' Trojan Tri-Cabin cruiser is a classic, aft cabin motor yacht that offers a spacious teak & mahogany interior with excellent accommodations plus an all-fiberglass hull. This vessel sleeps six in three cabins - two in A-berths forward, two in a convertible sofa bed in the main cabin and two in the ownerâ€™s cabin aft. 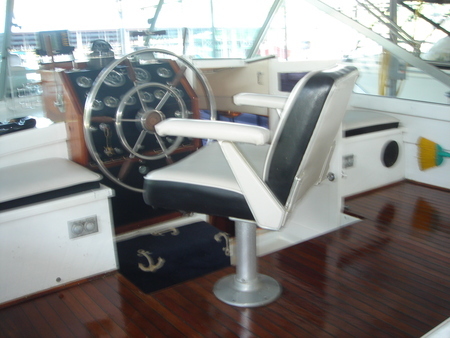 Once aboard, you are surrounded by custom fitted, varnished teak deck on the aft cockpit and bridge deck. 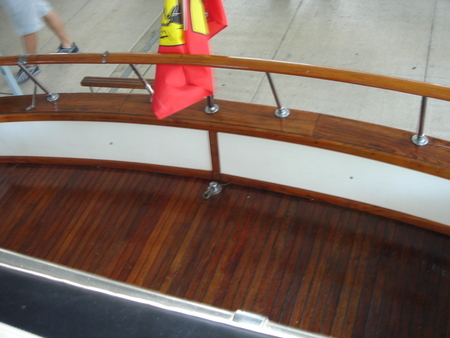 This vessel has a stainless steel ladder with four teak steps that lead up to the bridge cockpit and down to the teak swim platform. 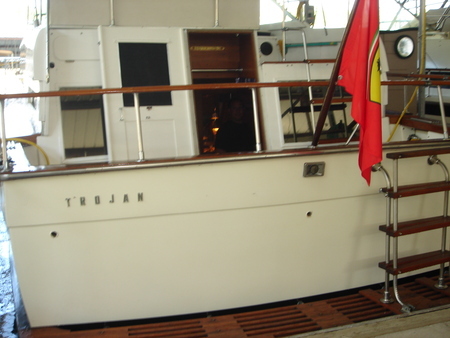 Manufactured in 1970 by Trojan yacht, a Wittaker Corp. subsidiary of Lancaster, PA., this M.Y. 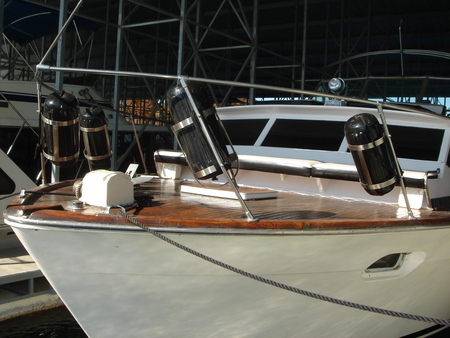 is constructed of a molded fiberglass hull that is hand lay-up of chopped strand and Fabmat. 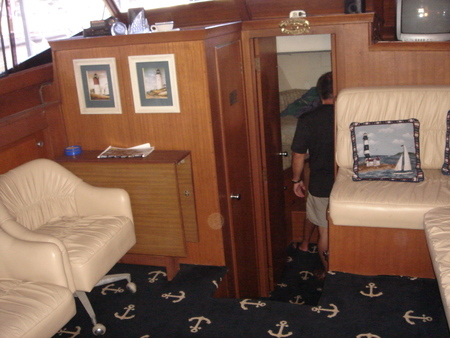 Below decks, teak cabinetry abounds in an attractive blend of updated materials to include custom order Navy carpet from bulkhead to bulkhead. The main cabin amidships, spacious and uncluttered, connects with smaller, tightly packed cabins forward and aft. 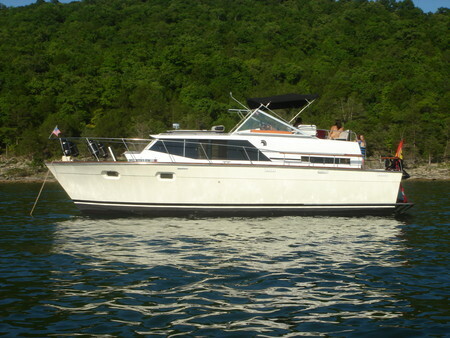 This vessel has the rare and desirable master aft cabin with 6' 6" head clearance. It is outfitted with twin berths with each bed situated over the engine cover boxes to maximize space. The master includes a stainless steel lavatory sink & faucet; electric vacu-flush head and a completely new custom, stand up shower measuring 26" x 30" with smooth black stone shower floor. Note: There is a shower box with strainer/pump installed under the aft floor utilized for grey waste shower water and is discharged over board. Moving inside towards the front, you will find the forward cabin has two A-berths, each with 5" thick mattress with memory foam top measuring 6' 2" by 27" and covered with new custom fabric covers. Storage bins under the bunks provide some stowage space while a hanging locker just aft of the starboard berth has room for coats or jackets. An 18"x22" hatch and two port lights, each 16"x7" allow abundant daylight, while for night illumination the forward cabin has two 12v overhead lights. There is a clever double-door arrangement in the forward cabin that connects the forward head and provides privacy from the midship salon and allows access to either cabin without walking through the other space. This is a thoughtful amenity when both cabins are in use. The main salon, midship is spacious, bright and inviting. Aside from the custom L-shaped, leather covered pull out settee in one corner and the compact galley diagonal opposite, all the space is open. Big plate glass sliding windows along both sides admit a flood of daylight, while four ceiling fixtures on the white vinyl-covered overhead provide excellent nighttime illumination. 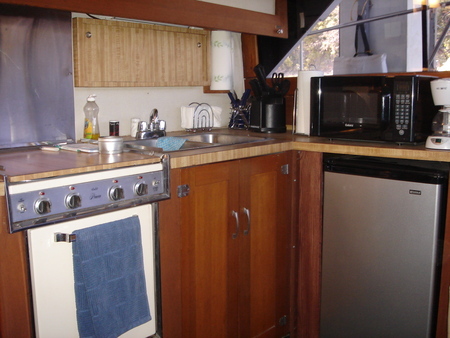 The galley includes a Princess 3-burner electric stove & oven, two compartment stainless steel sink with updated pull out spray faucet; microwave oven and compact undercounter refrigerator with a small freezer compartment. This Trojan is powered by twin Crusader Challenger model 260 V-8 gasoline engines coupled with Walter Velvet V-drive transmissions. 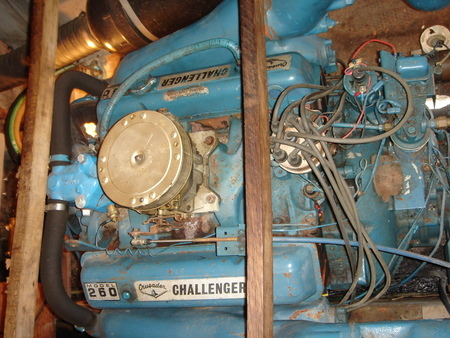 They are small block 350 cu. inch power plants. Both have recent service and very low run time since took ownership in 2007. Approximately 25 hours on the engines and only 8 hours on the 6.5 Onan gen set. We primarily use the boat to stay on while moored in the covered slip several times a year and we very seldom travel outside of the private marina. New bottom paint was applied in July 2005. Other equipment included...two galvanized steel 80 gal fuel tanks, a 50 gal. fresh water tank, a 20 gal Black waste water holding tank, a 12 gal hot water tank, a Hummingbird LCR 400 dept finder, a 750 W - large BoatSafe brand engine compartment heater, a custom stereo receiver/amplifier with Bose external speakers located both forward and aft deck areas. 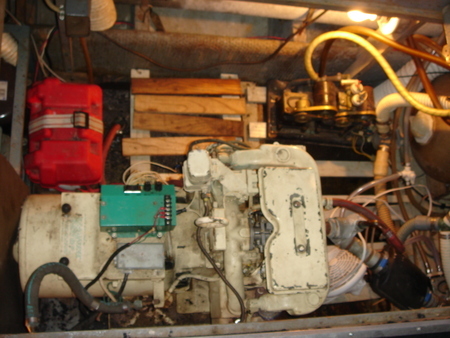 This vessel is also equipped with two 30amp/125 volt shore power connections and one new A/C compressor unit with updated wiring and cooling fans. on Table Rock Lake just outside of Branson, MO.